Hedi Slimane made his first statement about the future of the Yves Saint Laurent fashion house when he decided to drop the “Yves” from the line’s name. 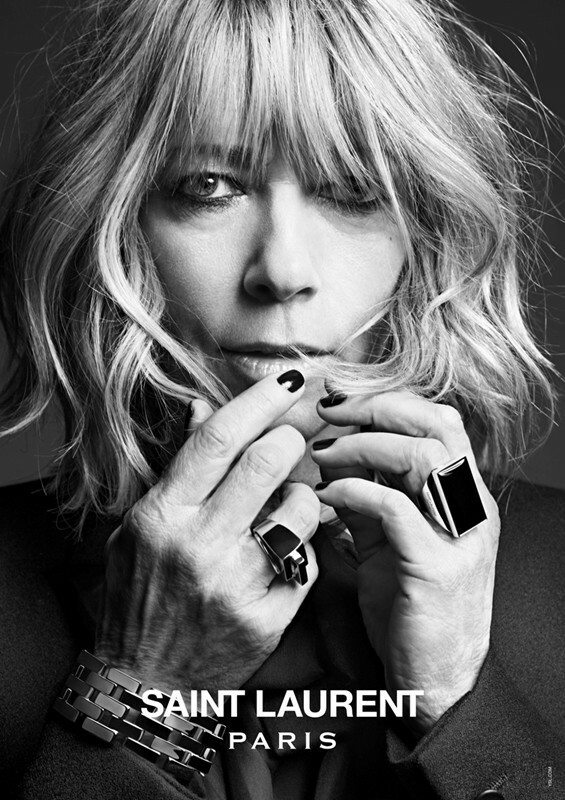 The thus-chopped-and-rebranded Saint Laurent also had a new master creative director at it’s maison’s helm in Hedi Slimane, a 44-year-old Parisian and self-described devotee of rock. The new house of Saint Laurent, like a teenager suddenly inspired to go by his last name only, is undeniably badder, louder, and more in your face. Slimane injected Saint Laurent with a rock ‘n’ roll aesthetic from the beginning of his creative control. He sent thrift-shop inspired 90’s-era baby doll dresses and grunge-chic outfits down the Fall/Winter 2013 runway, to both cristicim and acclaim, and recently made his boldest move yet. 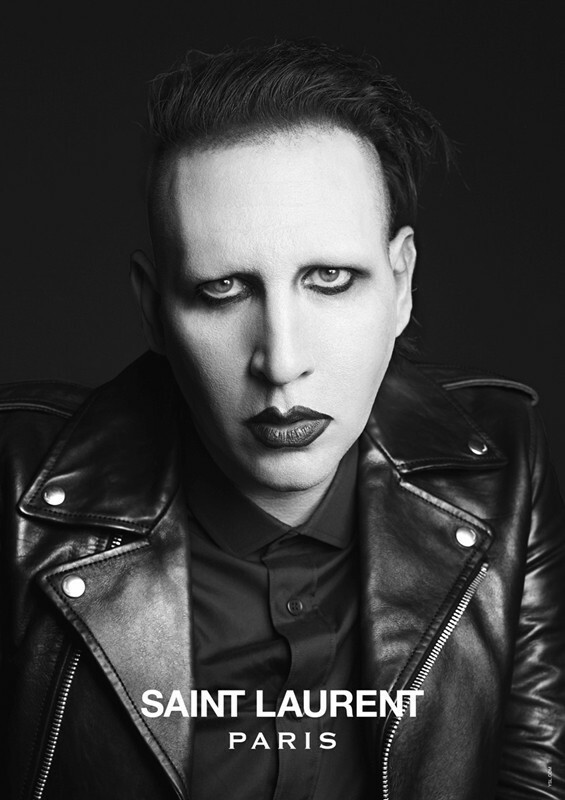 In keeping with his tribute to ’90s music, he has chosen 90’s heroin-chic singers Marilyn Manson, Courtney Love and Sonic Youth’s Kim Gordon as the faces of his Spring/Summer ad campaign. Of all the choices, Love might be the most shocking. That the bottle-blonde former junkie has an international bad-rap would be somewhat of an understatement, with her erratic public behavior and stints in and out of rehab calling into question the validity of the qualifying adjective “former.” She is, however, an open fan of the line’s new look, and has professed her enthusiasm for the collection on Twitter: “[H]aving gasms at the idea of rich ladies buying what we used to wear, finally someone got the actual look exact.” And to her credit, or perhaps to Slimane’s, Love is evocative in the black and white images. She appears both beautiful and savage, lovely and ragged, snarling and imploring. And who better to model fashion’s most hardscrabble, raw, and disorganized look than the dark horse of the movement herself? In the images, Love is an enigma, which is what we want her to be, a paroxysm of flint and rancor; her raw edges an exposed and tender pink. “Let it bleed,” a tattoo on the inside of her arm reads, held up against her haunted eyes, creating a discordant contrast with the elegance of her black evening gown. At first glance, she is challenging, her hackles-raised; at second glance, painfully yearning in her gaze. Bottom line, she does not look like a joke, as many critics snarked knowingly upon hearing the news of Slimane’s choice. How dare she, the former heroin addict, the broken raccoon-eyed baby doll, attempt to be the face of a great French fashion house? Slimane gambled with this oxymoron and won. Perhaps the brand’s boldness shouldn’t come as a surprise to fans. 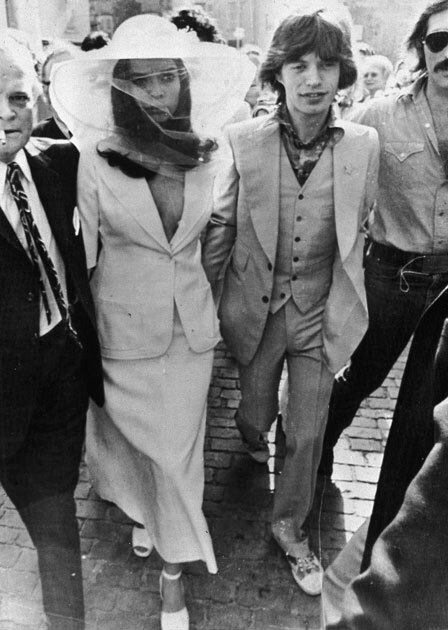 After all, it is the stuff of fashion mythos that Yves Saint Laurent dressed both Mick and Bianca Jagger for their wedding in St Tropez, May 1971. The luminescent bride famously stunned in her white YSL tailored marriage suit, and the image of the rock n roll couple’s well-heeled nuptials became iconic. The flood of photographs immortalizing the look was rock ‘n’ roll’s kiss of approval to Monsieur Yves on both cheeks, and the designer has never backed away from a cutting edge image since.